Finland and Sweden often arrange playful competitions between each other. We challenged both countries to an “intranet open” comparing the freshly published results of the Intranets in Finland 2014 survey with the corresponding survey in Sweden. The topics include intranet platforms, access to intranets, usage activity, content and functionality, and intranet governance models. For comparison, we use the most recent Swedish survey, Intranät i Sverige 2013 (Intranets in Sweden 2013), compiled by IntraTeam’s Kristian Norling, the results of which were published in early 2014. In Sweden, the survey runs for many years, whereas in Finland it was the first ever. 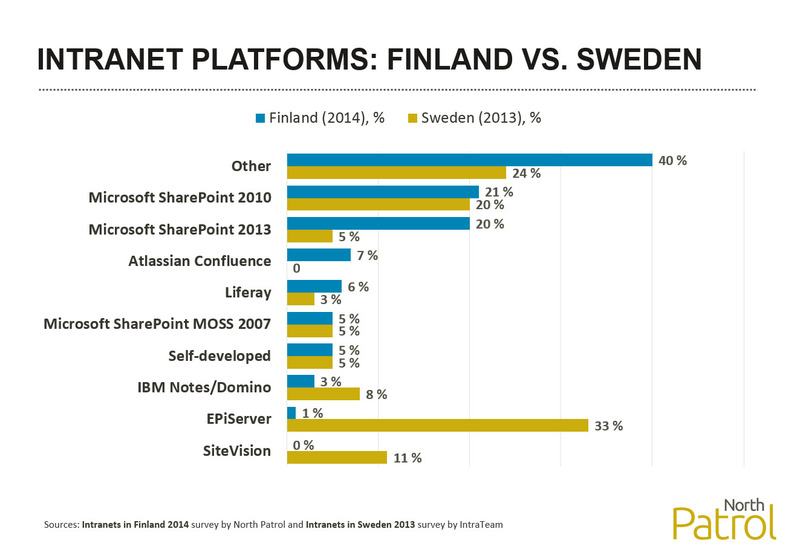 In Finland, the most popular intranet platform is SharePoint, in Sweden EPiServer. 33% of Swedish intranets run on EPiServer. EPiServer’s dominance is explained by the platform’s Swedish origins. — EPiServer’s supremacy as the most popular intranet system comes from its extremely strong position in all online publishing scenarios in Sweden, says Perttu Tolvanen, Web & CMS Expert, North Patrol. — EPiServer is a Swedish product that has built its position in its home country for years, which is why not even SharePoint has fully succeeded in challenging it on its home turf, Tolvanen continues. — EPiServer isn’t a bad intranet platform by any means, especially if you want social features, and particularly if you need language versioning. Its language version management is EPiServer’s trump card in comparison, for example, with SharePoint. That’s why large corporations sometimes consider it for their intranets even in Finland. — SiteVision is EPiServer’s most notable challenger as an online publishing tool in Sweden, but it has a dominant challenger position also in intranets despite its small footprint. For example, SiteVision is significantly more advanced in its social functions and document management than EPiServer, and on the whole, a somewhat more agile product than SharePoint. Despite its good integrator network, however, SiteVision is a very local product in Sweden, and its market position is largely anchored in its market share in Swedish local government. In Sweden, slightly more than half (52 %) of organizations use the same platform for their intranet and their public-facing websites. In Finland, the same platform for the intranet and public websites is being used by less than one-third of respondents (28 %). — EPiServer’s ubiquity makes the use of the same system for both purposes more attractive than the use of SharePoint in Finland. In Sweden, communicative intranets are a more popular concept than in SharePoint-dominated Finland, where group workspaces and document management are usually seen as an integral part of intranets. There are no real differences between Finland and Sweden when it comes to devices used to gain intranet access. Surprisingly even are the figures for intranet access possibilities from employees’ own workstations at the workplace (96 % in both countries) and the use of joint terminals (47 % in both countries). Only mobile use is slightly more often possible in Finland (43 %) than in Sweden (32 %). The difference in these figures may be due to the timing of the surveys: the Finnish one was conducted about six months later than the Swedish one. In both countries, respondents were asked to estimate the number of users who use the intranet daily, based on statistics or the respondents’ own estimates. The choices in both surveys differed somewhat, which is why the figures for this area are not totally accurate. In any case, Finnish respondents estimated that their intranets were more actively used than their Swedish counterparts. In Finland, 60 % of the respondents said that their intranets are used daily by at least half of the potential users whereas in Sweden this could be stated by only 48 % of the respondents. I believe the degree of activity is connected with what the intranet is used for. For example, whether it is only for communication (instructions, policies, internal communications) as is typical for EPiServer-based intranets, or whether the intranet is also a platform for teamwork, as is typical for SharePoint intranets. In both Finland and Sweden, the communications department is the typical owner of the intranet (see table below). The second most usual owner in both countries is IT. The Finnish results surprised us by the near non-existence of Human Resources as the intranet owner. In Sweden, the figure is significantly higher with one in ten intranets being owned by HR. Another noteworthy observation is that in Finland, more than ten percent of intranets don’t have a nominated owner. In Sweden, this happens in only a couple of cases. 23% of respondents say their intranet is absolutely governed with the goal in mind and methodically as a tool for realizing strategy. 56% say their intranet is “somewhat” governed with the goal in mind and methodically. 22% say their intranet is “not really” governed with the goal in mind and methodically. In the Swedish survey, intranet governance was addressed through different means. — Governance models are now a hot topic in the Swedish world of intranets, says Kristian Norling, who conducted the survey in Sweden. — Many organizations have taken important steps forward in making intranet development the responsibility of nominated employees, which has led to more tangible goals for the intranet being set by the management. In comparison with earlier years, many Swedish organizations have been successful in making the role of their intranet more important, and most importantly, initiating a dialogue with top management that makes the final decisions on resources. According to the results of the Swedish survey, the main goals of intranets are communication, making work easier, and supporting the needs of the organization. The Finnish survey went into more detail about individual intranet content and functionality than the Swedish one. That is why it is possible to compare only certain separate content and functionality items, which do not add up to a comprehensive overview. Below is a comparison of content and functionality items, although they are not completely comparable one-to-one on all cases. It is, however possible to draw the conclusion that Sweden has clearly more segmentation and personalization. This is due to the possibilities of the most popular platform, EPiServer, whereas in Finland the typical platform is SharePoint that does not lend itself to profiling as easily as EPiServer. What are the future trends of intranets, then? Kristian Norling puts videos at the top of the list. Video content is growing significantly also in Finland. Videos vary from high-budget strategy reviews to instructional videos on, for example, the use of a machine or device, shot with a smartphone camera. I also determined videos to be one of the six intranet megatrends in Finland. These megatrends are discussed in another blog post: First-ever intranet study in Finland reveals six megatrends. To summarize, the most important difference between Finnish and Swedish intranets is the platform used. EPiServer holds the number one position in Sweden; Finland’s number one, SharePoint, is in the second place in Sweden. The different system platforms affect the results on how actively the various intranet features, such as segmentation or profiling, are used. In the light of the surveys, there are no significant differences between Finland and Sweden when it comes to the role of the intranets. Intranets are being used for social purposes and communication, and approximately half of them also for teamwork. In both countries, the intranet owner is usually the communications department. In Finland, intranets are slightly more actively used. Mobile access and usage is also more common in Finland than in Sweden. Intranets in Sweden 2013 (Intranät i Sverige 2013)Compiled by IntraTeam’s Kristian Norling. Results published in early 2014. The online questionnaire collected 132 responses. The respondents represented organizations of all sizes, operating in a wide variety of industries, both in Sweden only and globally. In Sweden, the survey has run for many years. Intranets in Finland 2014 (Intranet-palvelut Suomessa 2014)This was the first time the Intranets in Finland survey was conducted. It ran from May 6 to June 8, 2014 and had 113 respondents from at least 94 different organizations representing all industries and business sectors, in sizes ranging from under 50 to over 10,000 employees. The survey by North Patrol included 36 questions. This entry was posted in Intranets and tagged comparison, governance model, intranet, Intranet content and functionality, intranet megatrends, intranet owner, intranet trends, intranets in finland, Intranets in Finland 2014, intranets in finland survey, Intranets in Sweden, Intranets in Sweden 2013, mobile intranet, platform, social intranet, survey, survey on finnish intranets, sweden, trends, usage by Hanna P. Korhonen. Bookmark the permalink. Great post and comments, are there any information on survey about differences how Sweden and Finland use Intranet platforms for overall communications, like is the same system also handling communication for Internet or Extranet? Thanks for the comment, Juha! The answer is hiding behind the lines and goes: “In Sweden, slightly more than half (52 %) of organizations use the same platform for their intranet and their public-facing websites. In Finland, the same platform for the intranet and public websites is being used by less than one-third of respondents (28 %).” This is mostly because EPiServer is widely used in Sweden for both intranet and public websites.